Here’s SaveKPFA‘s statement of principles. See our endorsers list. KPFA is an invaluable resource, sustained for decades by our diverse, local communities. As in the fight to save KPFA and the network in 1999, we oppose the Pacifica National Board imposing its own agenda on the station. 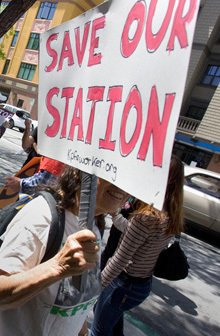 Funds raised from our listeners should support KPFA, not an overblown Pacifica bureaucracy. Quality programming attracts and keeps listeners. KPFA is world-renowned for its cogent and listenable news, commentary and public affairs broadcasts, as well as its groundbreaking music and cultural programming. Program changes should have broad appeal, especially during AM and PM drive time, and should help KPFA compete for new audiences to widen the reach of alternative news and culture. • KPFA’s listeners’ contributions have sustained the station since it was founded in 1949. Thousands of listeners objected to top-down programming decisions when Pacifica cancelled the popular and financially successful Morning Show, and local managers threatened to axe the 9AM Democracy Now! and arts programming. Fundraising work done by listeners — such as the over $63,000 in pledges raised by SaveKPFA — should be welcomed. • Support all staff and volunteers, without whom KPFA could not exist. Workers who give their time and talent should not have to worry about management intimidation when they organize or speak their minds. SaveKPFA led the successful fight to reverse Pacifica’s 2011 hiring of the nation’s top union-busting law firm. All staff should have a voice in the station, as well as training opportunities, a supportive and safe workplace, and the tools to do their jobs well. • SaveKPFA’s activists have steadfastly opposed the culture of secrecy in Pacifica, and have protected KPFA’s funds from being taken without accountability. Listeners and staff are entitled to understand how KPFA’s money is being spent and how our representatives vote.